The Aptitude Profit and Loss online Mock Test is Very helpful for all students. Now Scroll down below n click on “Start Quiz” or “Start Test” and Test yourself. Gain = (S.P.) – (C.P.) = Rs. (5800 – 5500) = Rs. 300. ∴ Required percentage = (295/420 × 100) % = 1475/21 % = 70% (approximately). For Rs. 6/5 , toffees sold = 6. For Re. 1, toffees sold = (6 × 5/6) = 5. ∴ Required S.P. = 125% of Rs. 1600 = Rs. 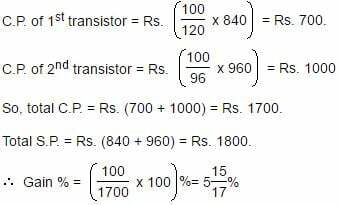 (125/100 × 1600) = Rs 2000. Profit = Rs. (392 – 320) = Rs. 72. Suppose, number of articles bought = L.C.M. of 6 and 5 = 30. C.P. of 30 articles = Rs. (5/6 x 30) = Rs. 25. S.P. of 30 articles = Rs. (6/5 x 30) = Rs. 36. ∴ Gain % = (11/25 x 100) % = 44%. ⇒ C.P. of 12 balls = S.P. of 17 balls = Rs.720. ⇒ C.P. of 1 ball = Rs. (720/12) = Rs. 60.
x = (18700×115 / 85) = 25300. Hence, S.P. = Rs. 25,300. ∴ Gain = (80/1600 × 100) % = 5%. A shopkeeper sells some articles at the profit of 25% on the original price. What is the exact amount of profit? To find the answer, which of the following information given in Statements I and II is/are necessary? Gain = 25% of C.P. In order to find gain, we must know the sale price of each article and the number of articles sold. I. Number of toys sold. II. Cost price of each toy. S.P. = Rs. 250 each. To find gain percent, we must know the C.P. of each. By selling an article what is the profit percent gained? I. 5% discount is given on list price. II. If discount is not given, 20% profit is gained. III. The cost price of the articles is Rs. 5000. I. Let the list price be Rs. x.
II. When S.P. = Rs. x and gain = 20%. ∴ Gain % = (7x/60 × 6/5x × 100) % = 14%. Thus, I and II only give the answer. What was the percentage of discount given? I. 23.5% profit was earned by selling an almirah for Rs. 12,350. II. If there were no discount, the earned profit would have been 30%. III. The cost price of the almirah was Rs. 10,000. ∴ C.P. = Rs. (100/123.5 x 12350) = Rs. 10,000. II. M.P. = 130% of C.P. = 130% of Rs. 10,000 = Rs. 13,000. From I and II, discount = Rs. (13000 – 12350) = Rs. 650. Discount % = (650/13000 x 100) % = 5%. Thus, I and II give the answer. II and III can not give the answer. Because we require profit percentage with discount and profit percentage without discount. So II and III are not sufficient. Since III gives C.P. = Rs. 10,000, I and III give the answer. Therefore, I and II [or] I and III give the answer. What is the percent profit earned by the shopkeeper on selling the articles in his shop? I. Labeled price of the articles sold was 130% of the cost price. II. Cost price of each article was Rs. 550. III. A discount of 10% on labeled price was offered. Question cannot be answer even with information in all the three statements. I. Let C.P. be Rs. x. Then, M.P. = 130% of x = Rs. (13x/10) . III. S.P. = 90% of M.P. Thus, from I and III, gain % can be obtained.